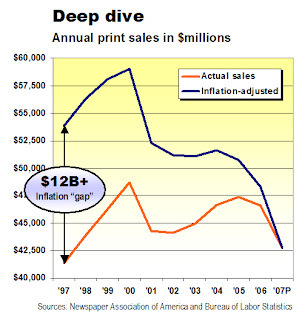 The decline in newspaper print advertising – now tracking to a 10-year low – is actually far steeper when you factor out the inflation that masks the severity of the deterioration. Minus inflation, sales are about 20% lower than they were in 1997. Based on the 8.6% sales decline in the first nine months of the year, it appears likely that print advertising for all of 2007 will total $42.7 billion, give or take. This will put revenues back to roughly the 1997 level, when sales were $41.3 billion. As everyone knows, $41 billion was worth a lot more in 1997 than it is today. So, the most accurate way to calibrate the industry's decline is by eliminating the effects of inflation over the last decade by translating its sales into what economists call “constant” dollars. With the assistance of an online calculator at the Bureau of Labor Statistics, you will find that the industry’s 1997 sales, stripped of inflation, would be worth $53.8 billion today in constant dollars. If you subtract this year’s likely $42.7 billion in print-ad revenues from the constant-dollar value of the sales a decade ago, the difference of approximately $10 billion means that today’s revenues are nearly 20% lower than they were in 1997. On a constant-dollar basis, therefore, industry sales this year will be about one-fifth lower than they were in 1997. Print sales matter, because they represent 93% of the industry's advertising revenues. The sales trend is illustrated in the graph below, which plots actual print revenues (orange line) against their value in constant 2007 dollars (blue line). With inflation eliminated from the sales numbers, you can see that the industry’s sales have fallen far more steeply in the last decade than the actual numbers suggest. Further, sales have been diving at an increasingly accelerated rate since 2004. As discussed earlier here, newspapers did a brilliant job of ramping their sales smoothly throughout the 1990s by boosting ad rates at will. Those remarkably consistent and predictable sales gains were derailed by the arrival of Internet and other disruptive, new technologies that give readers and advertisers unprecedented media alternatives. Seemingly dumbfounded by the arrival of serious competition for their audiences and advertising revenues, newspapers have been struggling for more than a decade, with meager success, to regain their relevance and economic vitality. Based on newly released third-quarter sales statistics, it appears the industry will achieve approximately $42.7 billion in print-ad sales in 2007, or an 8.2% less than the prior year. The last year newspapers had positive sales was 2005. The 2007 sales projection is based on a formula that assumes the industry will reap 29% of its annual turnover in the fourth quarter, as it has done reliably for several years. In the event cautious retailers like Macy’s pull their holiday advertising back from traditional levels, revenues could fall lower. Conversely, a bigger-than-normal burst of advertising in the fourth period could make for a better year than now seems in prospect. The 9% decline in print sales to $10.1 billion in the three months ended in September marked the industry's six straight quarter of year-to-year sales declines. The only worst performance in the last three decades was an eight-quarter sales slump in 1990-91. Last time, the Bubble bailed out the economy and the newspaper industry. If there’s another deus ex machina out there, we are more than ready for it. While lots more people came to the largest newspaper web sites this year than last, visitors stuck around for shorter times at nearly two-thirds of them. The good news is that the number of unique visitors at the 30 largest sites rose 21.2% over the 12 months to 97.5 million in October of this year, according to data provided by Nielsen Online, the independent ratings agency. The bad news is that the time visitors spent on the sites fell by 5.1% to an average of 12 minutes and 20 seconds per month, or a measly 24.67 seconds per day. 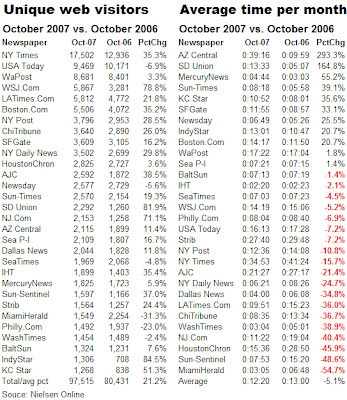 The year-to-year decline was broad-based, too, with visiting time falling at 19 newspapers and rising at only 11 of them. The decline of visiting time was more significant than the 5.1% average suggests. Gains of 293.3% and 164.8% in Phoenix and San Diego helped to statistically offset the double-digit percentage declines suffered by a dozen papers. If you eliminate Phoenix and San Diego from the reckoning, the industry suffered an average 13.7% decline in the time spent on its sites. In the worst of the cases, visiting time at the Miami Herald fell to an average of 3 minutes and 6 seconds this year from 6 minutes and 48 seconds in 2006. The Teflon effect at nearly two-thirds of the top newspaper sites is puzzling in light of the energy most publishers in the last year have put into building traffic with such features as 24-hour news, video, blogs, podcasts, slide shows, interactive commentary and user-generated, hyper-local content. With newspapers offering more goodies on their web sites than ever before, they should be seeing more stickiness, not less. So, what’s wrong? One explanation could be that the proliferating alternatives are fragmenting the audience faster than newspapers can coalesce them. For further discussion on this pooint, see Paul Farhi's must-read piece here in the American Jounralism Review. But another possibility is that surfers aren’t as riveted by dreary Associated Press videos of yammering politicians as they are by You Tube's cutesy clips of dancing Gumbys. Or, they may not be particularly intrigued to learn about stray terriers in Virginia or whether a certain Chicago-area reporter will serve Brussels sprouts on Thanksgiving. Declining stickiness is the last thing the newspaper industry needs, since it already severely trails slews of online competitors who are vying for the same audience and advertiser dollars. 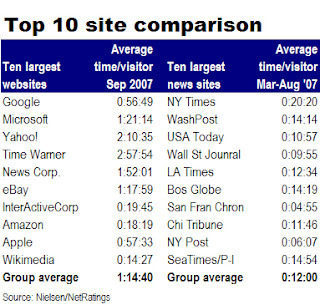 As discussed previously here, the average 12-plus minutes that visitors sampled newspaper sites in October is overwhelmed by the 1 hour, 14 minutes and 40 seconds that the average visitor spends in a month at the sites operated by the 10 largest web companies. The impressive gain in the number of unique site visitors over the last year may have been a mixed blessing. On one hand, it gave newspapers the opportunity to capture the loyalty of thousands, if not millions, of fresh visitors. But the weak content that evidently shortened the average length of visits at nearly two-thirds of the sites also could have turned off, potentially permanently, a substantial portion of the notoriously fickle online crowd. If newspapers intend to compete in the world of interactive media, they are going to have to do a ton of market research, product development and soul-searching to create sufficiently compelling sites to sustain the interest of the crowds they have been skillful, or lucky, enough to draw. They have no time to lose. The broad decline in reader engagement in the last year makes clear that newspaper sites need more industrial-strength staying power than they pack today. “Asking a newsroom to come up with innovative revenue ideas may be the cruelest of ironies,” wrote an editor recently tasked with developing new niche and advertorial products for his newspaper. Ironic? Yes. Cruel? Not necessarily. In fact, a dose of investigative reporting may be just what the industry needs to pull out of the long-running revenue tailspin that threatens to destroy it. The problem, of course, is that commercial discussions are strictly verboten in most American newsrooms. For sound reasons that contributed over the years to the credibility of modern newspapers, most journalists hold deeply to the principle that the news should be reported without heeding the interests of the advertisers who underwrite their work. I embraced and upheld the so-called separation of church and state throughout my career in journalism. And I freely admit that I might well oppose crossing the bright line today, if I had not exited the enchanted realm of journalism two decades ago to make my way in the real world of business. Now that I am on the outside looking in, however, I believe it is time for deeper collaboration than ever between the newsroom and the counting house. While I do not favor razing the Chinese wall that traditionally has separated the two, we have come to the point that it is time to start poking some serious holes in it. The resulting ventilation will do both sides a lot of good. This urgent and unorthodox suggestion results from my conclusion that the people on the business side of newspapers, whose job this rightfully should have been, have failed for more than a decade to gain a realistic understanding of how their intended customers perceive their print and online products. By “customers,” I mean not only readers but also advertisers – and the largest, fastest growing group of all – non-readers. Instead of evolving their businessses to address the rapid technological, economic, demographic and social changes that are disrupting the way people consume traditional media like newspapers, publishers for the most part have tried to optimize an ancient and outmoded model in myriad self-defeating ways: forcing through unjustifiable ad-rate increases, monkeying with circulation figures, chopping staff, shrinking newspapers and scrimping on customer service. My favorite stupid publisher trick occurred at a paper that halted deliveries to long-time subscribers because the newly down-sized circulation department fell behind in despositing the payments arriving in the mail. The faithful customers whose service was suspended, incidentally, were paying full boat, not the money-losing $20-a-year promotional price the paper desperately charges for Wednesday-through-Sunday home delivery. With the declines in circulation, revenues, profits and stock prices in the last few years proving beyond all doubt that chiseling isn’t a growth strategy, it’s time to try something completely different: building sales. And that’s where the newsroom comes in. Unlike the executives on the business side who got their jobs by being good, but not particularly inventive, at exploiting the monopoly-like advantages enjoyed by most newspapers until the arrival of the Net, journalists don't have to defend the relevance of their role in an increasingly ineffective business model. As such, journalists are the most objective and least personally conflicted people working in publishing companies. Further, most journalists possess a peculiar DNA that compels them to kick over rocks to see what crawls out. They, and they alone, appear to be the ones most likely to be motivated and equipped to ask such tough questions as what advertisers really think, what readers really want and, most importantly, what newspapers can do to regain the engagement of the advertisers and readers who have forsaken them. As journalists become involved in creatively identifying new audiences, new products, new markets and new revenue streams, one alternative that should remain off the table, obviously, is trading cash for news coverage. Putting the news columns up for sale would erode the most valuable commodity a newspaper possesses: Its credibility. The emergency facing the newspaper industry leaves journalists no choice but to broadly redefine their roles and overcome their near-universal reluctance to getting involved in the business of their business. If they don’t act to defend the economic health of the institutions that make their valuable work possible, the institutions themselves may be irreparably damaged or lost forever. I can think of no higher calling for a journalist. 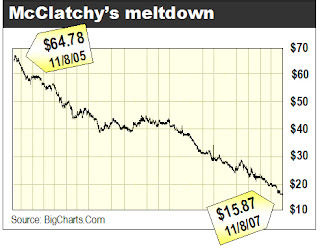 McClatchy’s staggering writeoff of nearly $1.4 billion in the value of its assets pales in comparison to the $4 billion drop its stock has suffered in just two years. That’s a decline, by the way, of 75.5%. As expected, MNI was forced by the conventions of public accounting to deduct from its third-quarter earnings an amount equal to the theoretical decline in the value of the former Knight Ridder newspapers it bought for $4 billion in mid-2006. The nearly $1.4 billion in accounting adjustments put the book value of the KRI properties at roughly two-thirds of what McClatchy paid for them 16 months ago. But these calculations, which are properly aimed at complying with the arcane rules of accounting, understate the true loss a McClatchy shareholder would have suffered if she owned the stock since this time in 2005. As you can see from the graph below, MNI’s stock has plunged to $15.87 a share yesterday from $64.78 on Nov. 8, 2005. That's roughly when the company began pursuing the KRI deal in what, ironically, turned out to be the last of the salad days for the newspaper business. If you multiply the decline in the stock price by the company’s 82.1 million publicly traded shares, you will see that $4 billion in real shareholder value has gone up in smoke. Sunday newspaper sales have fallen to a 32-year low of about 51.3 million, according to projections based on the latest report from the Audit Bureau of Circulations. The decline could become increasingly troublesome for publishers – who already have enough problems – because Sunday traditionally accounts for about half the total ad sales for the typical newspaper. Circulation dropped an average of 3.5% on Sunday and 2.5% daily in the ABC statistics for the six-month period ended in September, according to a statistical summary complied today by Editor and Publisher Magazine, the industry trade journal. Applying the circulation decline at the 600-plus papers covered by today’s ABC report to the total universe of more than 1,400 daily newspapers published in the United States, it appears that total Sunday circulation of 51.3 million this year will roughly equal daily circulation for the first time since Sunday newspapers began outselling the daily product in 1990. The slide in Sunday sales to the lowest point since 1975 will reverse a 17-year period during which publishers sold significantly more papers on Sunday than they did during the week, according statistics maintained by the Newspaper Association of America. Sunday sales hit a record of 62.56 million copies in 1993, as illustrated in the graph below. While Sunday outpaced daily circulation though the 1990s and into the first part of this decade, Sunday sales began to decline in 2003. 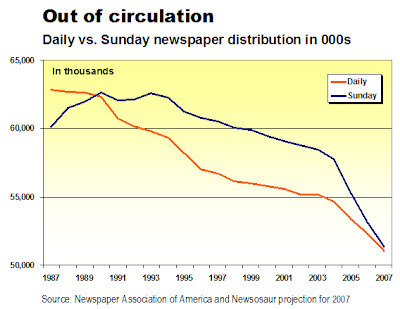 Between 2002 and today, Sunday circulation fell by 7.18 million copies, while daily circ dropped 4.12 million copies – a difference of 72%. An ongoing decline in Sunday readership, if unabated, could have a disproportionately greater impact on the already weakened economics of newspapers than a corresponding reduction in daily sales. That’s because Sunday sales historically have generated half of the advertising revenues at most newspapers. In the simplest analysis, it is easy to see how revenues would decline if a newspaper selling X number of advertising inserts for $Y per thousand had Z thousand fewer papers to stuff. Fortunately for publishers, the correlation between Sunday circ and ad revenues is not so direct and – at this writing, anyway – not so dire. It is likely that a significant portion of Sunday circulation was eliminated deliberately by publishers eager to do away with the high cost of hauling newspapers great distances to poorly penetrated locations. For reasons discussed previously here, here and here, the Denver newspapers shed 12.5% of their Sunday circulation in the last six months and the Atlanta Constitution trimmed 9.2% of its Sunday run. Advertisers never saw much value in distant circulation, so won’t be particularly ruffled by its loss. Newspapers also are protected for the time being by the fact that they have convinced most advertisers that the Sunday paper is the most valuable edition of the week, because readers spend twice as much time reading the Sunday paper as the daily editions. If advertisers continue buying this story, newspapers have a shot at dancing around a certain decline in Sunday circulation. But the dancing publishers are vulnerable to the question of how much time people actually spend with a newspaper, Sunday or otherwise. A survey commissioned by the NAA reported, in typically elliptical fashion, that 45% of its respondents spent an average of 60 minutes per issue reading the Sunday paper vs. 30 minutes with the daily paper. But an independent survey by the Pew Research Center for People and the Press found that national newspaper readership averaged only 15 minutes per issue in 2006 – a decline, incidentally, of four minutes (or 21%) since 1994. Given the enormous difference between the two findings, it is only matter of time before advertisers begin wondering which study is right. When the time comes, the dancing publishers had better be ready to face the music. Newspaper publishers congratulating themselves for meager gains in their online audience ought to take a look at the competition to see how far behind they really are. The average time spent at the 10 most active newspaper websites between March and August was 12 minutes per month, according to the Newspaper Association of America. By comparison, the average time spent in September on sites operated by the 10 largest online companies was 1 hour, 14 minutes and 40 seconds, according to Nielsen/NetRatings, the same agency providing online traffic data to the NAA. In other words, the average visitor spent 24 seconds per day in a 30-day month on a newspaper web site, as compared with an average of nearly 2½ minutes per day on the 10 sites operated by the web leaders. The statistics for Google aggregate traffic for its eponymous search engine, YouTube, the Orkut social site, Google maps, Gmail and much more. Yahoo’s traffic includes the portal itself, as well as such kin as Flickr, Hot Jobs and the like. Ditto, for Microsoft and the others. Newspapers are not gaining in absolute online traffic any more than they are not gaining in print circulation. In but one example, the New York Times website, which ranked among the 50 most popular sites as recently as 2003, today ranks No. 219 on Alexa.Com. Happy-talk press releases, which won’t fool even the dullest media buyer, are dangerous in two ways. First, they detract from the already weakened credibility of the industry. Second, they convey a false sense of progress to publishers, editors and ad sales people who ought to be scared as hell about the future of their industry. How can anyone take pride in the fact that the average visit at the San Francisco Chronicle website – which serves one of the most technologically sophisticated markets in the world – is a mere 10 seconds per day?